WOWOMAN is a platform created for women's development, inspiration, self-expression and motivation. WOWOMAN tries to make ladies life more colourful and give them different opportunities. They achieve this goal by having professional trainings/seminars/courses from local and foreign specialists; trainings and events for personal development, spiritual and physical rest; online platform where women can share experiences and ideas for motivation, self-expression and education; and author projects - “Tech-Tech khanim”, “My WOWOMAN BOOK”, “#qorxmasaydim”. 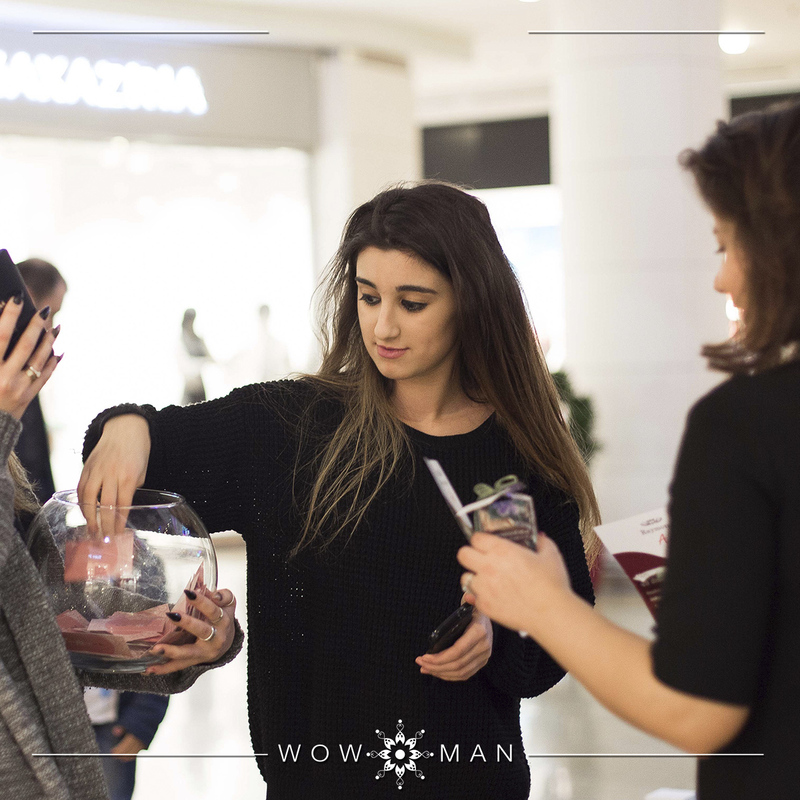 WOWOMAN team held a special exhibition with the support of Park Bulvar AVM dedicated to the 8 March International Women's Day. In the exhibition were shown our tender heroes' pictures and stories that you will not watch on movies or read in the books. They are not famous but throughout their life they have won various difficulties. The memorable event under slogan “Every woman is a hero" and SHEROES # hashtag took place on Park Bulvar AVM on march 6-13. Founder of the platform Zara Apetrei Huseynova said WOWOMAN seeks to increase attention towards ladies in society and operates to support their dreams not only on holidays, but also in ordinary days. "I have participated in many spheres: music, art, literature, sports. All these did not prevent me to get PhD in astrophysics." "Never too late to learn. Despite the fact that I am 42 years old and I have an extensive experience, a good education, I still study. Right now, I am a student of one of the most prestigious U.S University. At the same time, I learn to paint on glass." "When my father became ill, she supported him. While he was alive, she did everything to make him feel that he was surrounded only with care and love. And my mother never gives up!" "Her husband hardly believed that she would pass the entrance exams to the university. Although my grandmother got into college, studied and worked at the same time and then she gave her documents to the university. She has graduated from the university with honors." "We live in Azerbaijan, it is necessary to finish with it, you have already grown up." It was even surprise to me that I did not take it seriously. But I did not accept this. "In 2000 years when I learned about my illness, there was not any treatment of the disease Hepatitis C. In spite of it I did not lose courage, I got registration, gave blood tests to determine the genotype of the virus and waited for the development of science." "Today, I am a member of the Union of Artists of Azerbaijan, the Union of Artists of Russia, and the Union of the Association of International Designers and the gold winner of "Quality of the Century" of CQE." "2 March, 1993… Aydin lost his life in a bloody battle mission and reached the top of martyrdom. My heart broke to pieces. I became a mother and father to my children, now they are proud of me, and so I am." "I am wearing hijab. People around me think that a woman wearing hijab should only sit at home and do homework. The first time when I tried to find a job, a famous Azerbaijani scientist said to me a sentence: "You are a woman in hijab, sit at home, cook and grow your children. "Now I am grateful to him. His words gave me the incentive to put my goal." "As for the women who are not married or single, it is much more difficult to build their life as they wish. The reason of it is the negative thoughts that still exist in the society." "Soon I realized that it is possible to live with it and I had to be run my life in a wheelchair. I decided to live a meaningful life." "My younger sister has down syndrome. We do our best to avoid her not to feel “different”." "Wherever I have been from my childhood - mathematics and physics Olympics, chess and programming competition or in the events about information technology – I can say that I was the only girl among the participants." "They said that the child would not sit, walk, talk... But, some time passed after these shortcomings and we won; now my child are both running and walking." "Oh, oh, oh a women driver... How interesting is it…" These remarks inspire me even more and give encourage – these make me feel useful to society. More stories will be available at wowoman.org.